Image caption Nadar says that when the checkpoint near his home was established "bad things started to happen"
The Syrian authorities have committed clear and widespread crimes against the country's civilian population, the UN secretary general has said. He spoke as the Red Cross waited to get access to a bombed-out district of Homs, Baba Amr. Outside Baba Amr, a resident of Homs told the BBC how the conflict in Syria has changed his daily life. 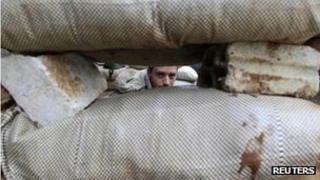 Nadar, a student in his twenties, lives by a Syrian army checkpoint. The area of Homs where I live with my family is safer than other areas, like Baba Amr. But four months ago, 25 soldiers with guns and a tank arrived here and built a checkpoint near my house. The next day, bad things started happening. The soldiers will just shoot at anyone walking on the street from sunset to sunrise - they have imposed a curfew. We have to keep all the lights off in our houses during this time. I once turned the light on at night and a soldier shot at our house with an automatic gun. Forty-two bullets hit my house and one of them went through the wall. They don't use normal bullets but very powerful ones. We now avoid sleeping in that room; it would be like asking to be killed. The soldiers from the checkpoint started inspecting all the houses in the area. Four soldiers with automatic guns wearing military suits came to my home saying they were looking for weapons. They searched everything - and stole anything of value, even my mp3 player. Twelve armed soldiers were waiting outside - all we could say was "You're welcome". Since then, my brother and I take turns to stay awake in case the soldiers come back. I'm awake all night until dawn, when I wake my brother up and go to sleep for a few hours. My sister, her husband and their children have moved in with us because their area is less safe. There are many of us living in a small place but that's OK because it might save my sister's life. When the heavy bombardment of Baba Amr started, things got a lot worse. The soldiers got more violent at the checkpoint. They searched every car and arrested people trying to get food and medicine into the neighbourhood. Now, they're not allowing people in or out either - we are closed in. Before, our electricity would get cut off for 12 hours a day, but in the last month, it gets cut off for one or two days in a row. Then we just get it back for six hours. Thankfully, when we saw tanks coming to Homs, we bought lots of canned food. We're surviving on sardines, tuna and beans. And we have bread too because there is a bakery in our neighbourhood. Some of my friends aren't so lucky and don't have bakeries in their areas so I don't know how they survive. Three days ago, the worst thing happened: our water was cut off. My neighbourhood just has a single well that we're now relying on for drinking water, and we don't even know if it's clean. Every day I queue for three hours just to get a bottle of water for my family. Hopefully, water will be turned on soon; otherwise we might die of thirst, not bullets. The checkpoint has made our lives hell. I want the solders to leave. But I have seen worse checkpoints around Homs, with 130 soldiers and snipers on rooftops that shoot at anyone.